Tim Maly, over at Quiet Babylon, is celebrating 50th anniversary of the concept of the cyborg (first coined in 1960) by soliciting brief essays from a bunch of writers. I contributed a very short essay that is adapted from a section of my new book. A snippet of the piece he is running as the first of 50 posts about cyborgs. 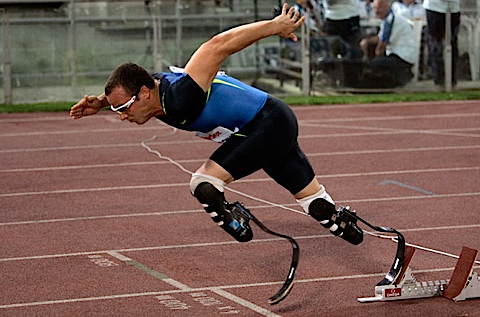 Double-amputee sprinter Oscar Pistorius at the start of the men’s 400 meters race at the Track and Field Golden Gala in 2008. We are not the same folks who marched out of Africa. Our genes have co-evolved with our inventions. In the past 10,000 years alone, in fact, our genes have evolved 100 times faster than the average rate for the previous 6 million years. This should not be a surprise. As we domesticated the dog (in all its breeds) from wolves and bred cows and corn and more from their unrecognizable ancestors, we, too, have been domesticated…. Clearly, we are self-made. We are the first technology. We are part inventor and part the invented. We have used our minds to manufacture our selves and thus we humans today are the first cyborgs. We have invented ourselves. And we are not done yet. When the technology will catch up with the biology, and that will be very soon. Evolution is gona go on as usual but much faster and with newly extended horizons. It is not as such evolutionary dead-end for us, we just happen to live in funny times. Wow. I never thought of that, but I think you are right. We are all cyborgs. Do you think that we can infer any kind of direction in this evolutionary process? If not, are there any characteristics that may be attributed to this process? I love your broad use of the term “technology” as a continuum of evolution – inventor and invented. Very thought-provoking…thanks Kevin! I agree . . . and wonder what we are doing to the future humans with with our junk food diet, hormone and disease fed cattle, exposure to human-generated toxic environments including TVs and monitors, chemicals in the household building/furnishing materials, pesticides, air pollution, sedentary life styles, etc. What kinds of human evolutions will come of necessity here? Possible humans without the complex digestive system, existing on totally pre-digested formulas? More brain capacity, less body? Are we turning into Greys? Interestng yet frustrating topic, when placed side by side with the question of equality. I struggle with this each day- seeing people (cyborgs) on the street who contribute nothing to the advancement of the human race, but actually help to keep it stagnant by failing to use their minds in a useful and realistic manner. You have dilusional people out there, enslaved by any institution (religion, political, educational, etc) that waves a pretty bow in front of them. People believing ridiculous notions about society, politics, religion, and the like, and all the while too stubborn to advance by someone else’s viewpoint. If the idea did not come from them, their tv show, or their respected forum, then it cannot be accepted. Therefore, we have a mass out there who refuse to take on new ideals, and start seeing that evolution takes some work. It takes effort, and in the right places. You also have the more agressive approach to humanity, which lies in few numbers; those who try to grow, and learn and think; to evolve. I am a person who has been trying to spread understanding about the corruption that lies deep within our society; that which has embedded itself into the moral fabric of our culture. I stand up and firght for the greater good of humanity, not just for myself. I don’t shrink from controversy like I see many doing, and at times, it makes me resentful of all those whom I fight for, but who don’t give a damn about me, and would rather persecute me in order to support and defend a corrupt institution; truly holding the the hand that holds them down. All that being said, when you reduce the the human down to a cyborg, they can become more dispesible in my dangerous mind, thinking as we do that our survival depends literally on the fittest of mind. So it is easier to accept a survival of the fittest mentality- the type you need if you are a corporate CEO, a politician, or an international banker, for a few examples. If the cyborgs won’t learn, then they will be taken for advantage. Now, understand that I am just theorizing out loud- perhaps these are thoughts that should be kept to myself, but I only think I’m being honest when I admit that I have negative thoughts towards many of those that I share this planet with. I think most people do daily. Just some more food for thought. I’d like to know your source(s) for the average rate of human evolution. What was the rate previous to the 10,000 years of rapid evolution? @Ashley: Check the book, The 10,000 Year Explosion, page 1.